KATHMANDU, Aug 21: Nearly year-long efforts to amendment the constitution a second time came to an end on Monday, with the ruling parties failing to garner the requisite two-thirds majority in the 592-member parliament. With 395 votes required for endorsement of the constitution amendment, the bill fell short by 48 votes. 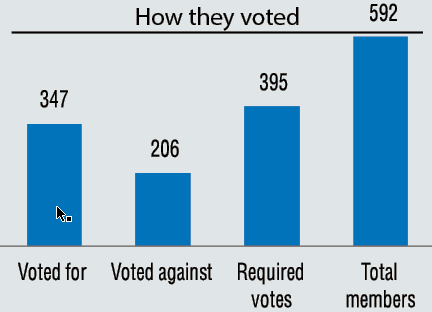 Only 347 lawmakers voted for the amendment bill, which was tabled in the House to persuade the agitating Madhes-based political parties to come on board the election process. Altogether 206 lawmakers voted against the bill and seven walked out in the course of the voting. “The constitution amendment bill has been rejected by the House as only 347 votes were garnered in its support, which is less than a two-third majority of the existing 592 members of parliament,” Speaker Onsari Gharti announced in the House after the voting. Ruling Nepali Congress (NC), CPN (Maoist Center), Nepal Loktantrik Forum, agitating Rastriya Janata Party Nepal, Federal Socialist Forum Nepal and few other fringe parties voted for the amendment. Main opposition CPN-UML, Rastriya Prajatantra Party, Nepal Workers Peasants Party, Rastriya Janamorcha and some other fringe parties voted against. The splinter faction of the RPP didn't attend the House meeting during the voting while CPN (Marxist Leninist) and Nepal Family Party lawmakers walked out during voting. The government was struggling to garner a two-thirds majority in favor of the bill while some political parties including the main opposition UML stood firmly against it. The bill was put to a vote even though it was almost certain to fail. The previous government led by Pushpa Kamal Dahal of UCPN (Maoist Center) had registered the bill in parliament on April 11, as demanded by the Madhes-based political parties. Largest Madhes-based political party Rastriya Janata Party had boycotted the local polls held in six of the seven provinces. It was demanding a constitutional amendment for greater political representation of the Madhesi communities. The government decided to put the amendment bill to a vote just a month ahead of local polls in Province-2, as the agitating RJPN committed itself to taking part in the polls even if the amendment failed during parliamentary voting. RJPN leaders have said that they will project the constitution amendment demand as their political agenda during the local polls in Province-2 scheduled for September 18 and the provincial and parliamentary elections schedule for November 26. The Madhes-centric political parties have been demanding revision of some provisions of the new constitution, terming the provisions discriminatory against Madhesi communities. The amendment bill had proposed forming a commission to review the boundaries of the existing seven provinces. Madhesi parties had boycotted the promulgation of the constitution in the Constituent Assembly (CA) in 2015 during the last moments of the endorsement process. The bill had included some issues related to the language of official business and formation of the national assembly, in a bid to address the demands of Madhesi parties. CPN (Maoist Center) had withdrawn support from the K P Oli-led government last year, accusing the UML of rigidity over the amendment. The Maoists then formed a new coalition with the Nepali Congress (NC) with the support of various agitating Madhesi parties. But Dahal had to step down without amending the new constitution due to an agreement with NC to hand over government leadership after the local polls. Though the largest party in parliament NC and the Maoists tried to amend the statute, their efforts yielded no result after second largest party UML turned its back and fourth largest Rastriya Prajatantra Party (RPP) remained divided over the amendment. The government had to withdraw its plan to put the amendment to a vote in parliament after 10 RPP lawmakers failed to appear at the House meeting scheduled for voting on the amendment on April 30. NC's Sher Bahadur Deuba, elected PM again in April, assured the Madhesi parties of amending the new constitution after the second phase local polls in three provinces. The recent split in the royalist RPP made the government's efforts more difficult after one splinter decided not to back the amendment. The previous amendment bill registered in parliament on November 29, 2016 had proposed changes to the boundaries of two provinces that sparked protests in Province 5. The revised bill however proposed formation of a commission for the purpose.